Based in White Plains, NY, Corporate Angel Network occupies an office donated by the Westchester County Airport. 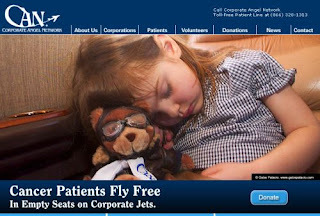 50 part-time volunteers and a paid staff of six work with patients, physicians, corporate flight departments and leading treatment centers to arrange more than 3,000 flights a year. Eligibility to participate in our program is open to all cancer patients, bone marrow donors, and bone marrow recipients who are ambulatory and not in need of medical support while traveling. Eligibility is not based on financial need, and patients may travel as often as necessary. I thought this was a note worthy post & you never know there may be someone out there that may need to use their services in the future. I think what they are doing is absolutely wonderful.